Meanwhile, Citi posts strong results, as Goldman Sachs reports weak third-quarter performance. 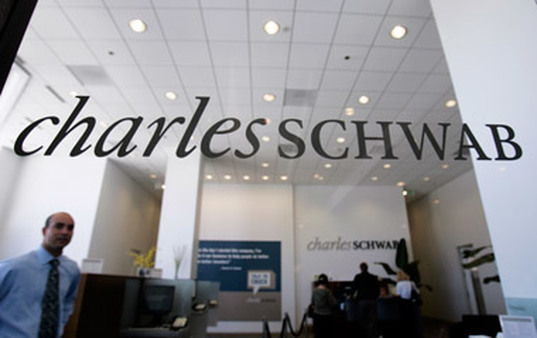 Beating analysts’ estimates, net income at Charles Schwab (SCHW) jumped 17% in the third quarter from a year ago to $376 million, or $0.28 per share, on revenues of about $1.6 billion, the company said early Thursday. Schwab was able to lower costs and increase margins. Its pretax profit margin rose to 36.5% from 33.4% a year earlier. Net new assets were $30.8 billion in the period, representing 7% year-over-year growth in Schwab Advisor Services, the largest RIA custodian, of $17.1 billion but a 27% drop in Investor Services of $13.7 billion. Overall client assets of $2.4 trillion were flat. About $1.3 trillion is held by clients in Investor Services accounts, with $1.1 trillion in Schwab Advisor Services accounts. As for sales, asset management and administrative fees grew 2% from last year to $663 million, while net interest revenue expanded 11% to $635 million. Trading revenue jumped 9% to $228 million. The company ended the quarter with 9.7 million brokerage accounts, 1 million banking accounts and 1.5 million retirement plan participants, Bettinger reported, up 4%, 6% and 6%, respectively, from a year ago. During the week of Aug. 24, client and prospect visits to Schwab’s website increased 35% and 58%, respectively, from the prior week, he said. Total calls to Schwab representatives increased 26%. On Wednesday, Schwab Retirement Plan Services, which serves about 1.3 million workers, announced it was rolling out advisor managed accounts for 401(k) plans. Retirement plan consultants who are registered investment advisors will be able “to build and manage customized investment portfolios for the plans they support, integrating recordkeeping services from Schwab Retirement Plan Services and managed account technology from Morningstar Associates,” the company said in a press release. “Advisor managed accounts give employers and retirement plan consultants acting as investment advisors much more flexibility in designing investment advice programs to meet the specific needs of employees. This is the next logical step in the evolution of 401(k) plans,” explained Steve Anderson, president, Schwab Retirement Plan Services, in a statement. Citigroup’s (C) net income improved 51% to $4.29 billion, or $1.35 a share, from $2.84 billion, or $0.88, a year earlier, topping estimates. Expenses dropped nearly 20% to $10.7 billion from a year earlier, as legal costs declined about 75% to $376 million. Sales, however, weakened 8% to $18.5 billion, excluding accounting adjustments, as trading revenue fell 10%. Goldman Sachs (GS) just missed estimates and reported a quarterly profit of $2.90 a share. The bank also fell short of revenue estimates, reporting $6.86 billion in revenues, as trading revenue fell 18% to $3.21 billion from the prior year. The company said it had an increase in investment banking revenue in the third quarter of $1.56 billion, up 6% from a year ago, mainly on the strength of results in its M&A. The bank’s underwriting division, however, saw revenues decline 14%, largely due to weak equity underwriting revenue, which dropped 55% from last year. Fees from debt underwriting improved 25%.